Whenever Melanie Holland peers through a microscope at a culture she has prepared, there is a good chance that she will see something that nobody has ever seen before. On the slide are tiny microbes (bacteria and archaea) that she has retrieved from hydrothermal vents on the ocean floor thousands of meters deep. These microbes live in an environment devoid of light and oxygen and at temperatures approaching 100°C. They form the base of a complex ecosystem that supports such amazing creatures as giant tube worms, white crabs, and octopii. Scientists such as Melanie have only just begun to probe these vents for microscopic life and have discovered just a fraction of what's down there. So each new culture Melanie prepares could contain microbes new to science. To collect these microbes, Melanie (or other scientists she has carefully instructed) has dived to the ocean floor in ALVIN, the Woods Hole Oceanographic Institution's research submarine. Melanie collects her samples from the hydrothermal fluids welling up from beneath the ocean floor. Because Melanie is interested in the conditions the different microbes require to survive, she takes careful notes on the location, temperature, and chemistry of the area she is sampling. A syringe attached to ALVIN then sips up a 750 ml sample of the hydrothermal fluid. The journey from hydrothermal vent to laboratory is an arduous one for the microbes. Still, many are able to survive the extreme drops in temperature (90° to 20°C.) and pressure (250 to 1 atmosphere). For the microbes to multiply, however, Melanie must re-create the environmental conditions around the vents. 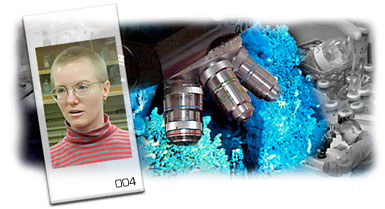 She seals the microbes in sterile air-tight test tubes to keep out oxygen since oxygen is toxic to many of the microbes. She may increase the pressure so that it is equivalent to 2000 meters under the ocean. The culture media need to include chemicals that the microbes metabolize. Many of the microbes are chemoautotrophs, meaning that they manufacture their own food using chemicals in the hydrothermal fluid. Because different microbes require different chemicals to survive, getting the chemistry of the culture media right can be tricky. Finally she puts the cultures in an oven or an oil bath to bring them up to the right temperature. If all goes as planned, the microbes multiply so profusely that they turn the liquid in the test tube cloudy. 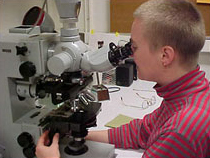 Melanie looks through a microscope in her lab at the microbes sampled from hydrothermal vent fluids. Because most of these microbes have never before been studied, there is a lot to learn about them. What are their genetics like? What chemicals do they metabolize? How are different species related to each other? Melanie, however, is most interested in the larger picture. What do the microbes tell her about the ecosystem where they live? How does the environment affect them and how in turn do they affect their environment? How do they interact with the other organisms living around the vents? The microbes can also provide clues about the physical environment in which they live. Scientists still don’t have a clear picture of the dynamics of hydrothermal vents. But by determining which chemicals the microbes from different areas around the vents require to survive, Melanie can make inferences about which chemicals are present in the water and the circulation patterns of the fluids erupting from the vents. Scientists are also interested in these microbes and the vent ecosystems they inhabit because of what they might tell us about the origin of life on Earth. Scientists hypothesize that life on Earth may have evolved under environmental conditions similar to those surrounding hydrothermal vents and that the first organisms may have been fueled by chemical energy instead of sunlight. Some scientists also think that similar conditions conducive to life may exist on other planets and moons such as on Jupiter’s moon Europa. Scientists have even found practical applications for these organisms. Enzymes isolated from high-temperature microbes are used extensively in recombinant DNA technology. Melanie has recently completed her doctorate at the University of Washington and has taken up a postdoctoral fellowship at Washington University in St. Louis. There she will be helping to development geochemical models of the hydrothermal vent systems. She is hoping to be able to use these models to predict what type of life might be found at different vents. Read an interview with Melanie. Get more info on Melanie's background. See images of Melanie at work. See Melanie's typical work week. Other sites related to Melanie's career.